74 multiple systems and supporters have joined our Open Letter to the Director on the harm of Split. (and counting!) Content warning: some remarks mention trauma, though limited to general discussion. We are the result of childhood abuse, neglect, and severe trauma. We are not murderers, we are not monsters. We are not cheap entertainment. We are a family and people, and we deserve to be treated as such. Not as a cheap scare. As a licensed Marriage and Family Therapist working with plural systems I am in complete agreement with this letter. The most horrifying thing about this movie is the glaring promotion of fear and stigma towards plural systems who are in reality a valuable and wonderful portion of the human population. Capitalization and promotion of unfounded fear and oppression of a marginalized group is truly disturbing. this movie is a disgrace. i have DID and i can’t even stand to watch the commercials on television. it’s despicable that hollywood would promote a film that plays on every hurtful exploitative stereotype of people like me. the vast majority of us got this way through severe child abuse. the only good thing about my past is the gift of DID. because that is what it is for me and many others living as multiples. a gift. a gift that we are shamed for. but it is you who should be ashamed. There are many different ways to exist is this world and the fact that someone has taken this variation of life – which is very much stigmatized and not really understood by the general public – and use it as a way to scare people is irresponsible and cruel. Pop culture heavily influences what people believe about the world, especially with an unknown or stigmatized topic. People at the helm of projects like this are doing harm. It needs to stop. Because capitalizing off of trauma survivors is disgusting. When you make money off a DID villain, you say to every survivor that you are grateful for the abuse they endured. Grateful for an excuse to make money. It’s abuse. It’s evil. Mr. Shyamalan: We should respect the rights of all people – especially those who are different from us – to live with respect, dignity and security. Vilifying any group and spreading misinformation for cheap thrills and making money is reprehensible. Mr. Shyamalan, you seem to be an expert on evil deeds: this movie has the potential to cause misunderstanding, hatred and harm to people with DID. How is this that not evil? Don’t be a coward…take responsibility for your actions and set the record straight about DID. I closely know someone who suffers from DID & I can’t support a movie that wrongly glorifies something they live with. This depiction is inaccurate & will never be able to show the fear & stigma they are forced to live with every day. Mental illness should not be used as a blockbuster idea. Not only does this film do serious harm to some of the most vulnerable individuals in our society, it’s an idea that has already been done to death. If you don’t care about how you are causing further stigma then maybe you care about having stories in your films that are actually interesting and unique. Or maybe following source material well enough that your films don’t earn Razzie Awards. I don’t tell people to give up, I tell them to do better. You have the resources and the fame so do something good with it. Making a horror movie about DID that doesn’t demonize the DID patient could have been so easy. Many of us are literal “final girls.” We have so many stories to tell. But instead we get more of this nonsense. Haven’t we already been hurt enough? I live an openly multiple life after years of hiding who we really are. I finally came to realize that I have just as much right to speak about my being multiple as singletons do about being singletons. Movies like this being made makes everyone more afraid to be who they are and that is wrong. I have had people come up to me and ask if one of the other personalities will like “knife them or something” when none of us are violent. The stigma is REAL. Because this movie HURTS. It will cause lots of damage, especially in areas with people that are even less informed about this topic than people in the US. We hope that people will be more tolerant and understanding in the future. My system mates and I, who are not harmful at all, want to be able to be open about being multiple without people having harmful stereotypes in their heads. 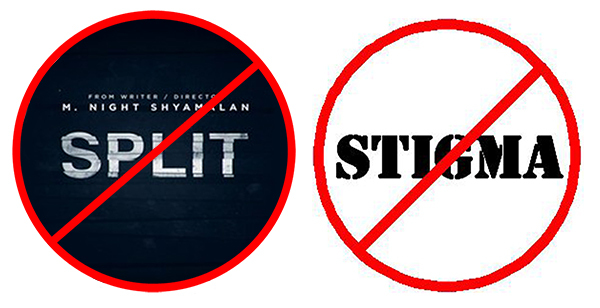 We just saw the trailer for Split and we are definitely boycotting. Our younger system member, Aaya, screamed when she saw the trailer 😦 Her father had to calm her down. This is not how DDNOS or DID should be portrayed. As a singlet who is neurodivergent in other ways, its clear to me that this movie is going to destroy lives and put many individuals, especially minors, at risk. Neurodivergent people are already vulnerable in a society that encourages punishing children and teens for showing any signs of being mentally ill, movies like this are just going to further this abuse. This movie is very likely to be the direct reason for a Multiple child or teens death. If you support this movie in any way, you are supporting the abuse and possible murder of teens for a mental illness they cannot help, and a mental illness that, in real life, is not harmful to anyone, and is in fact formed from trauma a majority of the time. DID and other disorders that cause multiplicity are formed as a way to cope with trauma in life. Even natural systems not formed from trauma are there to help people with any potential trauma or stress they may go through. Ableist interpretations of mental illnesses need to stop. I am signing because the film demonises mental illness, making it something to be feared by ‘healthy’ others. This underplays the true experiences of mental illness. Many people struggle on a day to day basis to get by. That is right, they struggle! They are not something to be feared, they are people and not monsters. In a society where we are supposed to more open about mental health should we not try to destigmatise mental health? Should we not be trying to alter perceptions of the public? Should we not be teaching people with mental health difficulties that they are not a problem or a monster? Shouldn’t we encourage them to seek the help and support that they need? Split is not just a film. Films are used as a method of communicating our cultural perceptions and ideals, and these films then further construct these perceptions. The process is cyclical. From Split it seems that we will learn nothing, instead we will step backwards in the mental health movement. Split only adds to the stigma surrounding mental health, and I am horrified. Because I have a friend who has DID and I know this movie is not an accurate portrayal. I have DID, and I agree: this movie is offensive and potentially harmful to people like me. In early December, in a community we’d just joined, someone spoke out. Many had, indeed. A small group decided to write a letter on a private forum, and that grew to a powerful testimony that attracted dozens of signatures! A site hosting that letter. A very small team launched the site just a couple weeks ago. With the letter. Signatures and views grew. A couple days after launch, we had the opportunity to see the film early, on Friday the 13th, of course. We didn’t want to go. The ads and trailers already showed a willingness to take the experience of being many people in one body and warp it towards evil for entertainment. But the opportunity to see it early, for free, and spread the word… We eventually found supporters to go with us and hang out after. We saw the whole thing, indeed! It took us about 36 hours to recover (that’s another blog post), and start writing the guide to the film. Published last Wednesday, traffic quadrupled. In first two weeks of the site, we’ve had over 1,600 unique visitors from 42 COUNTRIES! We weren’t even sure we were going to make this website. Today we just re-edited the movie overview and content warnings. Thinking about the content of Split continues to be the hardest part. Because #SplitMovieHurts. We hope to use our blog to break it down piece-by-piece. You gotta start somewhere. Thanks for meeting our efforts with attention and care. So many others are also doing great work, so thank you too. We are in this together.